When most people think of a vacation at the beach, they think of sipping a margarita or watching their children make sand castles on a gorgeous strip of coastline. The problem is most beach front property these days has been snapped up by developers, and whiling the day away on a chair reading the latest Grisham novel is more expensive than it’s ever been. Thankfully, RVers can still do the beach vacation on the cheap, but you’ll need to be on the lookout for good beachside RV parks and dependable free beaches. RV camping is perhaps the best way we have left as Americans to experience the thrill of a beach vacation without paying for the posh, packaged “resort” experience. One piece of advice is to find beaches that aren’t overdeveloped. Florida and California are well-worn beach destinations, likely to be crowded and expensive. What about Texas, or South Carolina, or Georgia? Places like Galveston, Texas make great beach destinations with lots of quality RV options, open beaches, and good fishing. If you’re willing to hunt for them, less popular beach destinations are ideal for family-oriented trips, they are less likely to attract the bikinis-and-booze crowd, they are more amenable to kayaking, canoeing, and fishing, and they often have fantastic prices for traditional regional seafood. If you insist on going to a vacation “hot spot”, be sure to look for the gems amidst the madness. Mission Bay, for example, has an amazing, slightly hidden RV Park only minutes from the Pacific. This self-contained world offers an incredible variety of amenities and is set on the gorgeous coastline of San Diego. Who knew? Finding gems like this one can be the difference between an ordinary vacation and a truly memorable one. Once you have located a destination and determined whether it is RV friendly, here are the next steps you need to take. First, find out what services the park offers. You don’t want to be heading to the laundromat or paying through the nose for electricity. You want to be relaxing. Second, determine whether free beach access is near the park, and whether the park is within walking distance of that beach. Nothing ruins a vacation more quickly than having to commute an hour each way to get to the beach. Convenience is the name of the game! 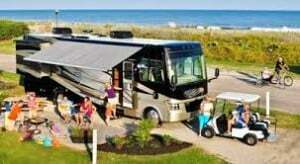 With a little work, the beach vacation of your dreams can be an RV adventure!